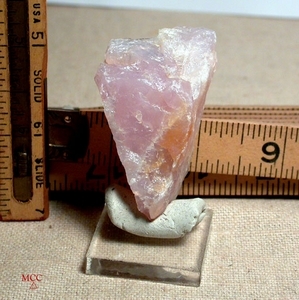 Lavender rose quartz has the inclusion of lithium [that happy balance] which makes rose quartz blush purply. This very rare California quartz, gem grade, has amazing translucency, rainbows, peachy iron inclusion, and is naturally rather heart shaped. 5/8"x 5/8>1-3/8"x 2-1/4" high, one side is slightly curved to lend ease to metalwork, wirewrapping and wearing. What a special focal - even for your cabinet of curiousities!